The UN has launched its largest ever annual aid appeal, saying it will need $7bn (£4.6bn) to help 30 million people in 31 countries during 2009. The amount is almost double the 2008 appeal due to soaring food prices and crises in Africa, among other factors. Sudan is the subject of the largest individual appeal, at $2bn, followed by Somalia, DR Congo, Zimbabwe, and Iraq. "The global financial crisis has raised inevitable concerns that there could be a decline in humanitarian funding in 2009. I urge member states and private donors not to let that happen," Mr Ban said in a foreword to the appeal. The UN's chief humanitarian official John Holmes said the aid target equates to only a "few cents of aid" for every $100 of national income in rich countries. The money will be used to provide drinking water, emergency shelter, medicine and other basic necessities to people in Africa and the Middle East. 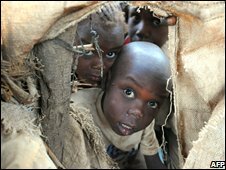 African states will receive the most assistance from the Humanitarian Appeal 2009, the largest since the creation of the so-called Consolidated Appeals Process in 1991. The UN is seeking $2.2bn dollars for Sudan, $919m for Somalia, $831m for the Democratic Republic of Congo, $550m for Zimbabwe, and smaller sums for Kenya, Chad, Uganda, Central African Republic and Ivory Coast. The latest appeal also includes a request of $547m for programmes in Iraq and surrounding countries, and $462m for Palestinian territories. Last year, the UN asked for $3.8bn in its initial appeal, and later sought $3.2bn more in "flash appeals" to respond to natural disasters in Bolivia, Madagascar, Myanmar, Pakistan, Tajikistan, Yemen, and southern Africa. Donors only provided $4.7bn of that $7bn total. As a percentage of economic output, Saudi Arabia, Norway, Monaco, Luxembourg and Sweden were the top five humanitarian aid providers in 2008, according to UN figures.